Ice dams form when chunks of ice collect at the edge of your roof, preventing any melted snow from properly draining through your gutters and away from your home. This creates pools of water that can eventually seep under and damage the shingles of your roof. This pooled water can also leak into your home causing water damage like peeled paint, warped floors, or even collapsed ceilings. Some of the signs to look for to identify an ice dam include icicles hanging from your roof or gutters, water dripping through your ceiling or down your walls, or chunks of ice filling your gutters. 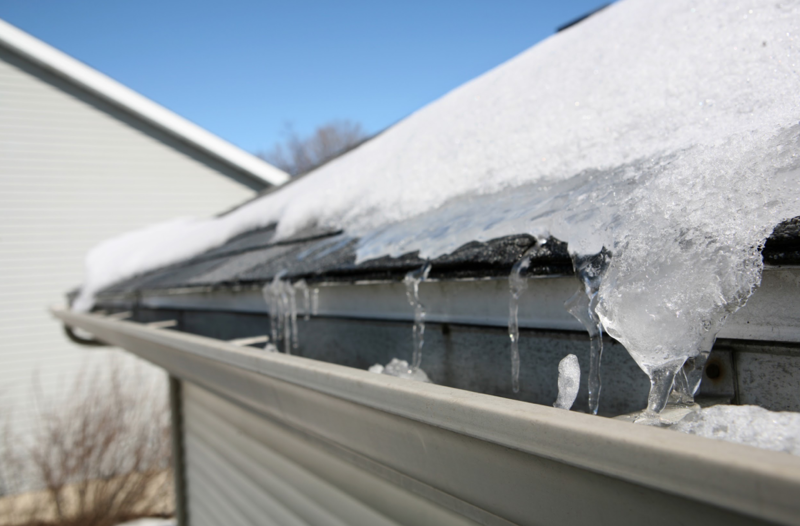 Ice dams form when the heat from your home rises to your attic and warms the underside of your roof. While the underside of your roof warms, the eaves along its edges remain cold. As the snow melts on your roof, it then refreezes along the eaves, creating a solid dam of ice. Make sure your attic is properly insulated to keep heat from your home from rising and melting snow and ice on your roof. Seal off any gaps to keep heat from rising to your attic. Any leaks caused by gaps in drywall, cracks around window frames or chimneys, and unsealed access hatches can all lead to heat loss. Have your attic inspected for proper ventilation. Maintaining a consistent temperature between your roof and the attic below is crucial to minimizing the risk of ice dams. Install heat cables along the eaves of your roof. This will help melt the snow that accumulates on the edge of your roof much quicker so that it doesn’t freeze and cause a buildup. Remove the snow from your roof after a heavy snowstorm. This will not only reduce the risk of a roof collapse under the weight of the snow, but it will also help significantly reduce the risk of an ice dam forming. Staying on top of snow removal is important, but always be alert to personal safety as well. Homeowners can purchase roof rakes to safely remove snow while standing on the ground or hire professionals with the proper equipment to safely do this. Clean gutters ahead of a heavy rain or snow storm. Oftentimes, gutters may still be clogged from leaves and other debris from the fall months. By cleaning out gutters, homeowners can help alleviate any backup that may increase the chances of ice dams. We hope these tips help save you from the hassle of an ice dam this winter. If you have more questions, however, we work with over 500 independent agents who are ready to help. Visit our website to find a local agent near you: bit.ly/QuincyFindAgent.